Is the Trizone Ankle Sleeve for me? The Trizone Ankle Sleeve is ideal for athletes who need mild-medium support for weak ankles, a strained ankle, swelling/inflammation, or general ankle stability and support. Applies compression and fits into most shoes. Still not sure? Try our Brace Advisor for personalized product recommendations to meet your needs! 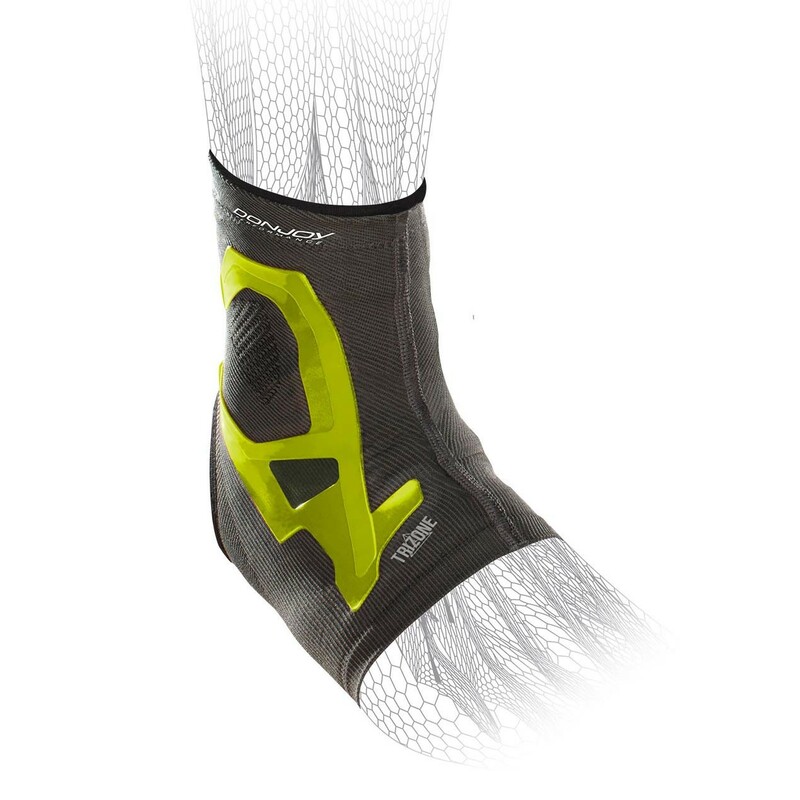 Our Trizone Ankle Sleeve is part of the DonJoy Performance brand. The Trizone line offers a mid-level bracing support for athletes. Trizone technology combines compression, warmth, and support all-together. The material is low-profile which allows you to wear it comfortably for training, games, and competition while maintaining peak performance. 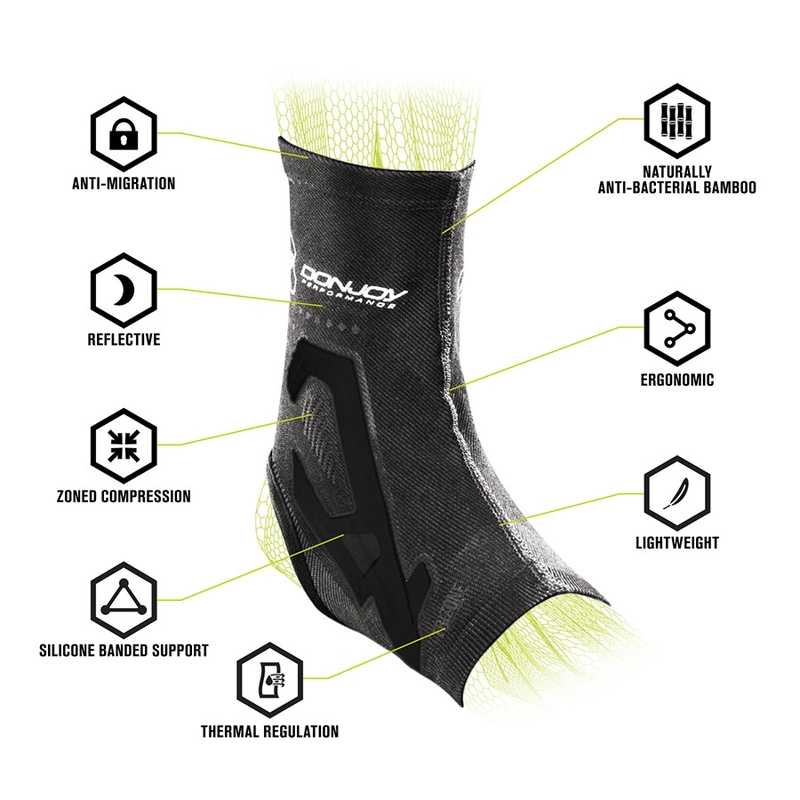 Stand out on the court or in the field with protection from this hybrid ankle support. Available in orange or black. Can fit either ankle (left or right). This is a single product and does not come in pairs. To Clean: Wash by hand with mild soap and air dry. I'm looking at some sort of ankle injury preventer for my promising high school freshman basketball player. I just know how injury prone ankles can be in this sport. What do you suggest? I am recovering from a broken ankle and want to get back to gym and workouts. Need ankle support now that I am out of the boot. Injury is 3 months old. Broke both tibia and fibula but breaks were clean and surgery wasn't needed. What would you recommend? We would suggest something with a bit more support, the DonJoy Stabilizing PRO Ankle brace would provide better stability and support while you are regaining mobility and strength. Yes, the DonJoy Performance Trizone Ankle Support does not have any rigid supports so it will not restrict range of motion. I have chronic ankle instability and also play soccer. I don't want a bulky brace, will the trizone help me? I have had two ankle ligament reconstruction surgeries. The last one was 4 years ago. I am an avid runner and exerciser. I need a brace that will give me support/take away the pain while I'm working out. I don't need something to wear all day, just while exercising. I don't have much balance or stability when standing on my left ankle. I don't want something that is bulky or takes too long to put on and take off. Any recommendations? The DonJoy Performance Trizone Ankle has mild compression at the arch, medium compression on top of the foot, and maximum compression with silicone banding on the inside and outside of the ankle. It is thin and low-profile, fits comfortably and easily into all shoe types without difficulty. You could also looks at the DonJoy Stabilizing Pro Ankle Brace. https://www.betterbraces.com/donjoy-stabilizing-pro-ankle-brace. It is great for ankle instabilities and is designed to meet the needs of demanding athletes. My ankles are weak because I have Peripheral Neuropathy. I'm using a cane to help with balance. Will your product help to stabilize my ankles? I have had a history of ankle problems and need a brace that can substitute for taping an ankle, I cannot do bulky. What would you recommend? I have planters fasciitis and weak ankles. I also over pronate. Will this help me. I have orthodics and sleep in medical boots. I need to get away from the over pronation. Will these help. The Trizone Ankle will offer only mild support to the ankle and most likley will not provide enough support to help prevent over pronation. The Don Joy Stabilizing Pro ankle brace will provide enough support tp help with your porblem. I just had an ankle spain and wanted to look into a brace that i could where in the water when i surf. I need something that wont stretch when soaked in water and is not too bulky. Any suggestions? The Trizone is a mild support but if you want better support I would suggest the Don Joy Stabilizing Pro Ankle Brace. My ability to put pressure on outside of my foot. Also weakens my ankle . Which brace is best to help this condition . I have sever posterior tibial tendinitis would this provide enough support for the arch and the tibial tendons? I am looking for a brace for a mild inner left ankle sprain. I need support but movement for my running. The Trizone provides mild support and compression to the ankle. The A60 ankle brace is another alternative that will offer a littl more support. I am an elementary school teacher who walks and stands all day. I walk for fitness 3-4 days a week. I've been diagnosed with peroneal tendonitis,not sure how I did it. I'm now being weaned off CAM boot after 2 months. Suggestions for a brace? I do NOT want to reinjure. Thanks! I broke my ankle four years ago and have a plate and four screws. What type of ankle brace would be best for crossfit traing? I am in the Marine Corps, my job requires me to were combat boots, I continue to roll my ankles on hikes and movment over uneven terrain. What product will best provide support to my ankles and fit inside a boot that laces t up to 8 inches in height? I recently sprained my right ankle (2 months ago) healing nicely...... and want a brace I can wear for Spartan Races (up to 15 miles in and out of water, 30 plus obstacles. Is the Trizone a good option? What would be the best ankle brace to help with anterior ankle impingement during activities like playing basketball? I'm looking for an ankle brace that will support my ankles during my training runs and triathlon competitions. I haven't had a major injury but I would like to keep it that way:) any suggestions what would be the best support and least bulky? I would suggest the A60 ankle brace. It has mild ankle support yet it is not a real bulky brace and could be worn by a runner. I am recovering from a grade III ankle sprain and I am looking for something that will provide support when I will do classic and skate nordic skiing. I already have the donjoy velocity brace, but it doesn't fit into the boots. Could you suggest one brace? The DonJoy Stabilizing Ankle Brace is a very supportive ankle brace but comfortable to wear and will fit into shoes. I had a partial tear of my achilles tendon and rcently had a PRP injection to help repair it. Will this help provide support for my achilles during my workouts or would the PS6 foot sleeve be better for my achilles. The brace has two air bladders so that when you step down on your heel the air is pushed to the bladder on both side of the Achillies to compress the tendon. I broke my ankle in 2011, it was a very dibilitating injury. To the point there's is no cartilage remaining in the ankle joint. I Had a custom brace made cast for my foot, but was unable to get it due to lack of insurance. Would have a brace that would allow me to get back to an active lifestyle? Looking for something for my ankle, similar to your Proform Double Wrap Wrist. Don't need much support but compression for my osteoarthritis, while waiting for a Total Ankle Replacement. Thanks! How does this fit? It seems really big on the video model. If I want it tight do I have to go down a size?? I am recovering from a really bad ankle sprain, no fracture,. Right now I am wearing the bulky Aircast Airsport ankle brace. In about a month I am wondering what would be the next step for me.. I will be traveling overseas so I have to plan ahead and have to do a lot of walking in airports etc. I don't think I will want just a sock on my ankle.. What would you advise? Is this Trizone more of a compression sock? Does it run big or small? Thanks for your help. My ankle is fused. Will this brace allow me to be more stable when walking on uneven ground, i.e., a golf course, sand traps? Could this brace be worn underneath another, more supportive brace? I have ankle joint degenerative disease - bad arthritis. I want to try bracing before confronting ankle fusion. Would you recommend this (or other) brace? I enjoy the outdoors such as hiking, snowshoeing and hunting. I am 66. Hi, I am a skateboarder who recently broke my outside malleolus ankle bone. The break has healed, but tendons and ligaments are still tender and sore several weeks later. I want to continue skateboarding, but need an ankle brace that provides movement, but protects at the same time. Also fitting well inside of a shoe. What are your suggestions? I have a talar body fracture. What brace would you recommend I use in the future? Would this product be useful for a person with Haglund's deformity? Do you recommend this for anterior ankle impingement? It is aggrevated especially when I play golf. This braces is a sleeve and will provide warmth and compression. If that is what you are looking for then this would be suffcient. If you are interested in some kid of support for the ankle then I would suggest either the Air Cast A60 ankle support or the Bionic Ankle Suuport. This will fit either ankle? I noticed that wheen ordering it did not have a right or left option so I'm assuming it will fit either ankle? Yes, the DonJoy Performance Trizone Ankle will fit either the right or left ankle. Is it waterproof? I am looking for something that I can wear when lap swimming. Yes, you can wear the DonJoy Performance Trizone Ankle Support in the water. Just rinse with fresh clean water and let it air dry. Is the silicon banding on both sides of the brace, or just one? The silicone banding is on both sides of the brace. i suffered a grade III ankle sprain over a year ago, and have some scar tissue providing support (no surgery). will this product be supportive enough? Great support, comfortable, able to play soccer in it as well as sleep comfortably. I need really good support for my ankle but hard to find a product that does that and is not too bulky--this one is just right!! My son has ankle problems from running. No other ankle brace helped him. Once we ordered these braces, he has no pain when he runs. His time has gotten faster and he is beating his record each race that he does. He loves that these fit in his shoes with no bulk or discomfort. Great for light support. Fits comfortably in shoes. You barely notice it's there. Love it! Helped with pain and support almost immediately thinking about getting another one for the other ankle. I need more lateral support. I thought this would give me enough but it didn't. Wonderful compression and secure feeling! Excellent for minimal protection. Not too bulk and fits in all my shoes comfortably. The compression is just right, not too restrictive and allows my ankle to move but still secure. Gives me complete confidence when playing basketball or chasing the kids around the yard.